THE Australian team's bid to survive beyond the preliminary rounds got a lot more difficult after they were beaten by a star-studded Spain side at the basketball Arena on day four. The Spaniards, with five NBA players compared to one - Patty Mills - for Australia, survived some strong first-half resistance from the Aussies to eventually win comfortably, 82-70. The Aussies were naturally disappointed with the result, but remained defiant. There are obviously areas in which they accept they need to improve, but they are not going to change their basic approach. "We're going to play the same way we do every game," said Joe Ingles. "If that's good enough for us to get a win, we'll get a win. We believe in ourselves, and we're going to play our style of basketball. Hopefully, that will be enough. "We pride ourselves on defence, and we'll continue to do that, and, hopefully, at the end of the day, we'll get through. You've got to back yourself in a tournament like this, and try to fight through any lapses." Australia has now lost its first two games - the other was against Brazil - and must win its remaining three games to guarantee a place in the quarter-finals. But, depending on other results, two wins could be enough to get Australia through, since four of the six teams from each of the two groups will advance. Australia played a fabulous first quarter, and thoroughly deserved their 19-14 lead at the end of it. They played at a fast pace, and were tough in defence. They consistently made it hard for Spain to get good looks at the basket, and came up with some great shot-making themselves. Joe Ingles, Patty Mills and David Anderson did the scoring early, as the Aussies built an 8-6 lead, and as the quarter wore on Brad Newley and Aron Baynes got on the scoresheet. Mark Worthington came up with a three-pointer at a crucial time as well, after Spain had grabbed a 13-12 lead. Worthington's shot spurred the Aussies on to finish the quarter strongly, beginning a 7-1 run. But it was always going to be hard for the Aussies to maintain that level of intensity against a Spanish side that was bound to respond by increasing the intensity of their own play and forcing Australia to have to work even harder. Spain began eating into Australia's five-point lead immediately the second quarter began, and after coming up with three of the first four baskets of the term they were in front, 22-21. Baynes was forced to sit down at this point, having made three fouls, and Australian coach Brett Brown sensibly called a time-out to try to steady the ship. The Boomers were getting a bit sloppy, not shooting as well as they had earlier and not rebounding as well either. But Spain quickly kicked out to a five-point lead, 26-21, after the resumption of play, challenging the Aussies to lift their game. Fortunately, they did, with baskets from Newley and Ingles cutting the lead to one point. Mills, who had been off since midway through the first quarter after picking up two early fouls, returned midway through the second and showed some spark. Spain got to a 31-25 lead, and Australia fought back to be 34-32 down. The Aussies managed to hold it together towards the end of the term, which got physical with Ingles and Serge Ibaka tangling in a battle for a rebound. Spain's Rudy Fernandez hurt his head when he crashed into an advertising boarding and a photographer, and went to the dressing-room early. 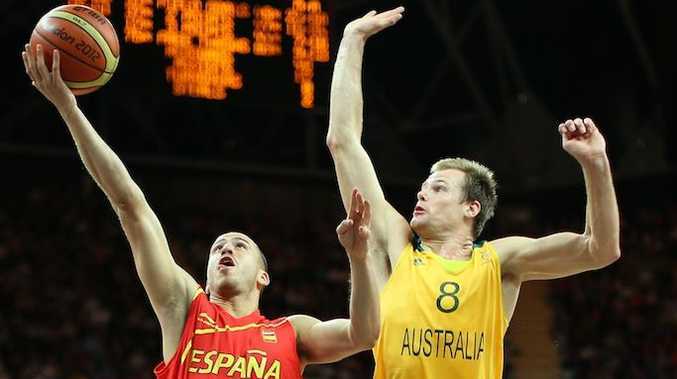 Spain led 37-32 at halftime, and the Aussies needed the break after their opposition had begun to dissect them. But the game began to get right away from the Boomers when Spain went on the rampage immediately as the third term began. The Spaniards scored the first 10 points of the quarter to push their lead out to 47-32. Australia desperately tried to respond, but Spain kept answering them. After Australia had cut the deficit to 13 points, 49-36, it soon blew right out to 24, with Spain leading 61-37. Spain was bombing away at will, and with the game gone it was now up to the Aussies to try to find it within themselves to at least stop the bleeding. The Spaniards starting resting some of their big names towards the end of the third quarter, which could only help. Spain led 63-42 at the end of the third term. Australia stuck at it in the final term, and with Spain continuing to rest some stars the Aussies began to eat into the deficit and rebuild some confidence for their remaining games. Australia's next game is against China.